VU Partners With IGNITE To Train 1 Million People - PM Inaugurates "DigiSkills"
Prime Minister Shahid Khaqan Abbassi inaugurated DigiSkills Training Program, aimed at training one million youth through online modules in Islamabad on Thursday. Addressing the ceremony, the Prime Minister said the present government has delivered in many fields by building motorways, ports, airports and establishing power plants but the advancement in the information technology sector is most important contribution in the last five years. The Prime Minister said that Digiskills program will equip the youth to get online jobs and earn money through a non-traditional way. He said that he has full faith in the youth of the country and expressed the confidence that the girls will, in future, excel in e-commerce. He said the government on its part is committed to ensure availability of broadband in every inch of the country and the Prime Minister appreciated Ministry of Information Technology & Telecommunication (MoITT) and Virtual University of Pakistan (VU) for their role in the development of youth through ICT and Digital services. 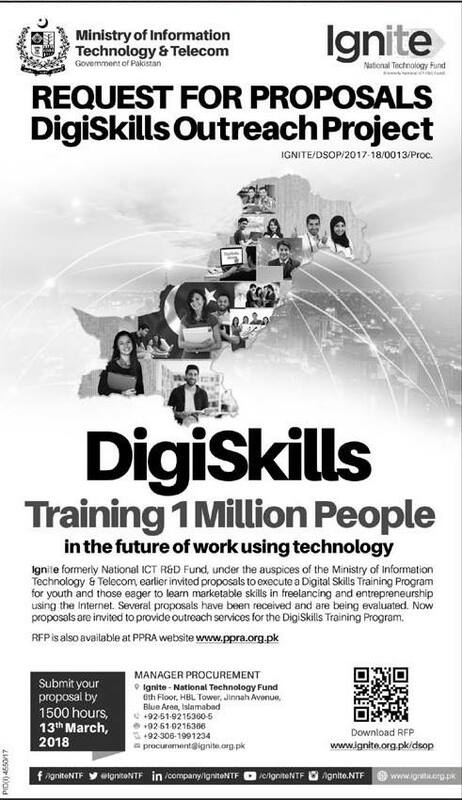 Addressing the inaugural ceremony, Minister of State for Information Technology and Telecommunications Ms. Anusha Rehman said the DigiSkills program is an important endeavor of the Ministry that will create online employment opportunities to enable youth to earn 200 to 300 dollars per month. She said with the help of this program youth from across the country will be providing their services to the entire world. One million youth of Pakistan could get benefits from the program. She said Pakistan is emerging as an IT-leader in the world and government is committed to enlighten the future of our young generation with the use of latest technology. Earlier, while welcoming the guests, Dr. Naveed A Malik, Rector VU apprised the audience about the University and its capabilities to handle mega projects such as “DigiSkills”. While addressing the audience, Mr. Yusuf Hussain, CEO, IGNITE acknowledged the capacity and potential of Virtual University of Pakistan to undertake such mega project. He also congratulated for VU for winning the project through a competitive bidding and coming up on top against 6 bidders that also included foreign entities. He further talked about Artificial Intelligence that will be a very important part of such project in future. Later, an agreement signing took place at the Prime Minister Secretariat in the presence of Prime Minister Mr. Shahid Khaqan Abbasi. Dr. Naveed A. Malik, Rector Virtual University of Pakistan and Mr. Yusuf Hussain, CEO · Ignite - National Technology Fund signed the MoU for DigiSkills Training Program. The DigiSkills Program is aimed at equipping our youth, freelancers, students, professionals, etc. with knowledge, skills, tools & techniques necessary to seize the opportunities available internationally in online jobs market places and also locally to earn a decent living. The first batch of DigiSkills Training Project will start in May 2018. Labels: Admissions, VU Partners With IGNITE To Train 1 Million People - PM Inaugurates "DigiSkills"